The 2018 Disney Parks Mom Panel has been announced. 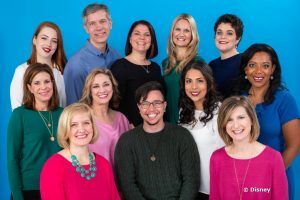 The 11 new panelists, selected from thousands of applicants, aim to make the Disney vacation planning process easier by offering personalized guidance and by providing honest and relatable vacation tips. The Disney Parks Moms Panel is an online resource that can be found at www.disneyparksmomspanel.com. Get ready, get set, type! The application process for the 2018 Disney Parks Moms Panel begins at noon EDT Wednesday, Sept. 6, and those interested have until noon EDT Wednesday, Sept. 13, to express their interest. The Disney Parks Moms Panel has evolved from its inception in 2008, but its goal remains the same: to … Continue reading "2018 Disney Parks Moms Panel selection process begins Sept. 6"
Inviting Moms, Dads and In-the-Know Family Members to Apply for the 2018 Panel LAKE BUENA VISTA, Fla.: Aug. 15, 2017 — Are you the person your friends and colleagues always seek out for heartfelt advice on planning a Disney vacation? Have you put together more amazing Disney trips than you can count, and do you … Continue reading "Disney Parks Announces Moms Panel Search"
The Walt Disney Company has unveiled its 2017 Disney Parks Moms Panel, and among the new members is the panel&apos;s first openly gay mother. The Disney Parks Moms Panel, which answers online readers&apos; questions about planning Disney vacations, has included a gay dad, but the lesbian mother is a step forward in terms of diversity - and one that Disney is willing to tout in its press release and on the panel website. Get ready, get set, type! The application process for the 2017 Disney Parks Moms Panel begins at noon EST Wednesday, Sept. 7, and those interested have until noon EST Wednesday, Sept. 14, to express their interest. Disney fans on social media channels have been taking note for several weeks as excited tweets and posts reveal those who had been given coveted spots on the 2016 Disney Parks Moms Panel. This month, however, The Walt Disney Company has officially revealed the full panel, and there are fewer new members than in past … Continue reading "Introducing 2016 Disney Parks Moms Panel and upcoming website changes"
The application process for the 2016 Disney Parks Moms Panel begins at 10 a.m. ET Tuesday (Sept. 8), and those interested have until noon ET Tuesday, Sept. 15, to express their interest. Kristin takes a look at the new Polynesian Village Resort from a family perspective!